Also this version supports the newest API from Facebook - geo-coded postings. Now you can write reviews for Places. "Bookmarklets are special links that users can add to their browser’s favorites. These special links include code (i.e. not just a target URL), and they trigger various kinds of useful functionality, allowing you to modify and extend any web page." - it is what they typically do. Check out our updated directory of bookmarklets. The latest version includes building Custom Like pages for any opened URL, for example. "Cisco on Thursday announced new location-based analytics technology intended to help retailers better understand consumer behavior and deliver more compelling experiences, including personalized advertising. The new offering is also designed to help businesses and institutions capitalize on existing infrastructure by transforming the Wi-Fi networks they already maintain into revenue-generating vehicles." - from here. Here is a link to Cisco blog. So, we were right with our SpotEx approach. Now you can do it yourself. Our mashup Like Me has been updated. It lets you define your own reactions for Like buttons. More precisely, this mashup creates mobile web page that shows your own content to the visitors liked some predefined resource. 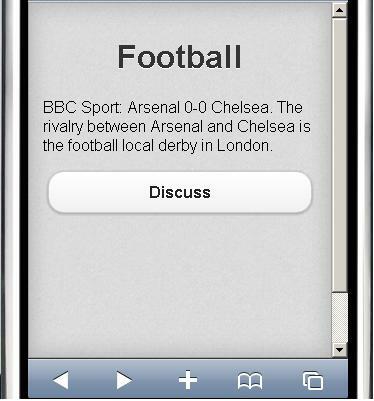 Mashup creates mobile web page (could be opened in any HTML5 mobile web browser). You can use link to that page in your own mobile sites (portals) or present it directly to your mobile visitors (e.g., via QR-code). You can track the perfomance for this page with Google Analytics. As some add-on to our previos post about telecom development with Asterisk - one old article. Our Asterisk stuff has been updated. See here a new approach for telecom services development in Asterisk. Code (LGPL) is hosted on Google projects. Asterisk web gate lets you turn telecom services development into an ordinary web development. Any telecom service there is just a CGI script. An interesting discussion: How to know whether a journal is good to publish with? "Developers don't have real access to the radios. That means that developers can't build systems like Tawkon can: that see radiation or energy levels used by the device, but it also doesn't let developers build real indoor navigation apps. You do realize that if you had access to the radios you could tell exactly where in a room you were standing, right? (Wifi is like light, it sprays across a room, and if you can triangulate its strength you'll know where in your house you are standing)." Really, for network-proximity applications like our SpotEx it would be good. Our Geo Trace mashup has been updated. This web tool lets you visualize the results for traceroute command. traceroute is a well known network diagnostic tool for displaying the route (path) and measuring transit delays of packets across an Internet Protocol (IP) network. Simply perform traceroute from your own computer, copy results into web mashup window and click Show button. You will see the intermediate nodes right on Google Maps. Mashup creates QR-code for mobile page (and the page itself, of course) with Facebook's Like button. As soon as QR-code (e.g. placed on the product's wrap) is scanned and an appropriate URL is opened in the mobile browser we can show Like counts. And of course, mobile user will see who from his/her friends likes that too. As a result – we have a simple recommendation system on the basic elements from Facebook. You can define your own URL for redirection as soon as mobile user hits Like button. The latest release includes for example our new web mashup Like maker. Our mashup Twitter location has been updated again. It lets you publish geo-related information to Twitter. It is not about geo tagging in Twitter. Actually users do not need to geo-enable their accounts. Twitter location is just a way for publish messages (statuses) with some geo-related data. Click on the map and mashup will prepare for you a link to appropriate Google Map. Our mashup Geo Mail has been updated. It is a mobile web application (HTML5) that lets you add a digital signature (link) with your location info to email messages on your mobile platform. 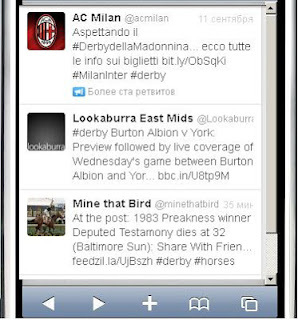 It works on any mobile platform with HTML5 support: iPhone, Android, Samsung etc. P.S. btw, there is a useful trick with mobile email. You can send email message not only to some person, but to service too. For example, Facebook lets you update status info by email (see https://m.facebook.com/upload.php regarding service email for your account). The same is true for Blogger, etc. 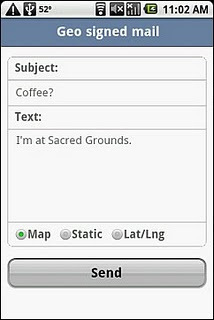 If you send status mail via Geo Mail mashup than you can share your location info with your Facebook social graph. It is yet another implementation for Places. 4th round of API Mashup Contest kicks off. API Mashup Contest, the biggest API playground in the world, is here again! Register your API mashup before NOVEMBER, 30, 2012. Your mashup will be assessed by experienced Jury members. The contest is open to developers from any part of the globe. See more details here. Mashup let you create QR-code for direct map loading and HTML fragment for placing that QR-code on site (blog, etc.) So, it is a tool that helps you create and distribute mobile maps. Type (size) for map could be configured. A collection of Video sharing (streaming video) apps for mobile. We are collecting references for our Mobile web pairing project. Lets you search for the links (recommendations) in the social networks. You can move map (walk in) from one tip to another, ask questions, see discussions, respond etc. In the latest version you can also copy any location you are interested in right to your mobile phone (via QR-code). Just click on the phone-icon near the POI name. QR-code lets you load a mobile map (from Geo Messages project) right to your mobile browser. You can simply bookmark it there for example. P.S. See also our previous posts about ForumSquare. 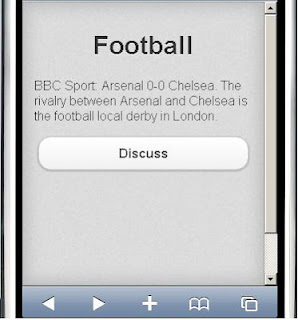 Web pairing for mobile phones. A basic service. It lets you connect two smart phones so you will be able to transfer data from one to another. More precisely – it links two browsers. Actually, you cal link mobile to desktop, desktop to desktop, mobile to smart TV, etc. The key idea is that internet connection should be enough for passing data from one browser to another (from any screen to another screen). There is no need to download applications. Everything should work in the browser. 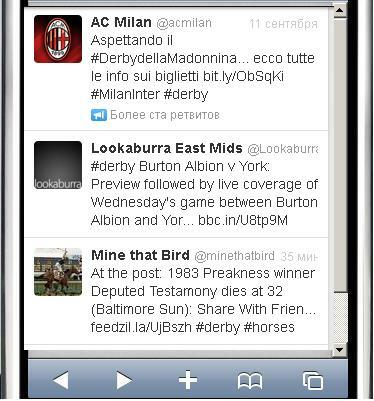 The latest release includes for example our new web mashup Twicus and TV communication tool based on discussions in Twitter. As Google explained, TV no longer commands our undivided attention, with 77% of viewers watching TV with another device in hand. In many cases people search on their devices, inspired by what they see on TV. 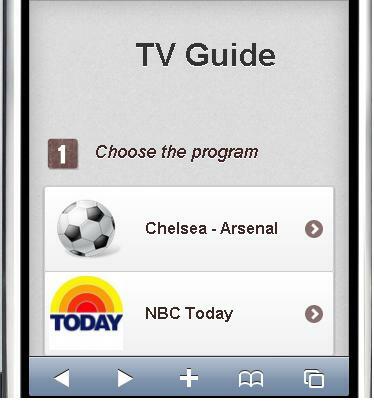 So, TV applications are opening up a new business frontier for the mobile industry. For example, TV related Communications tools give users a way to engage with others in social networking conversations or activities related to a program while it is airing on the TV screen, are the most common types of companion products and the easiest to implement. 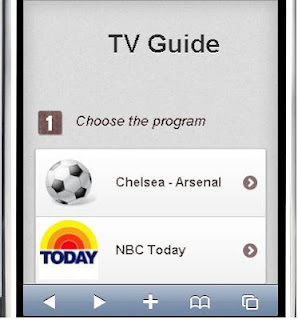 The device and app complement the TV but do not interact with it. It is a place for program related content, advertising, etc. And this page contains Discuss button. But how our potential user can remember our hash-tag? Here we can use an idea described in the model example for Twitter discussions. He does not need to remember has-tag. During the first visit to that page hash-tag could be printed right in his own timeline. Together with the explanation what is it and what this tag devoted for. It is an analogue of check-in. And for the each subsequent call our application will directly move user to the twitter search for an appropriate hash-tag. Because tag’s description was published in user’s timeline he will be able find it and return back to that discussion any time later even without visiting our TV guide again. It is a very simple and easy reproducible way to maintain discussions about TV content, sports events etc. an interesting article: How Disney built a big data platform on a startup budget. The Disney platform has a foundation of Hadoop, Cassandra and MongoDB complemented by a suite of other tools for particular use cases. A good comparison for context-ware app development on iPhone vs. Android. Simply: there are many things that not available for developers on iPhone. That is, for example, why our SpotEx is Android based. Our mobile web mashup - Ask friends has been updated. HTML5 mobile web application presents a wrapper for Google (Bing or Yandex) search and lets you share your search query with your friends in Facebook. Mashup simply posts your query on Facebook's wall and redirects you to the search engine. Who will help you the most - search engine (SERP) or your social graph from Facebook? Our social directory mashup has been updated. Find the right people in your social graph: http://servletsuite.com/fbdir/ See your connections to companies, schools, cities via your friends. P.P.S. trends for hackaton: food and photo. Check out our Food from Twitter for example. Our mashup Social Graph Directory has been updated. It lets you present your Social Graph data (friend’s data) in the simple tabular form. Answers to the following typical questions: do you have contacts in a particular company, city etc.? Also it lets you see additional info about your friends (like WHOIS for Facebook). The latest version lets you find classmates and common interests too. The latest release includes for example our new web mashup Twicus. It lets you organize discussions in Twitter. An interesting site: "Appmarket.tv is the Internet’s first portal dedicated to the convergence of players expected to meet in this convergence of media - the web developers, the broadcasters, the consumer electronic manufacturers, the Pay TV crowd, the content creators, Mobile community, VC's, startups, designers, creatives, agencies, and eventually, even consumers will find our site useful." Best paper awards. Computer Science. One of the most delicious from our mashups has been updated. Get an idea about your next breakfast, lunch or dinner right from Twitter. Mashup Food from Twitter shows you the live stream of food pictures just published in Twitter. See what other people are eating right now. New version supports Instagram and own image hosting from Twitter. Speed for search has been optimized.